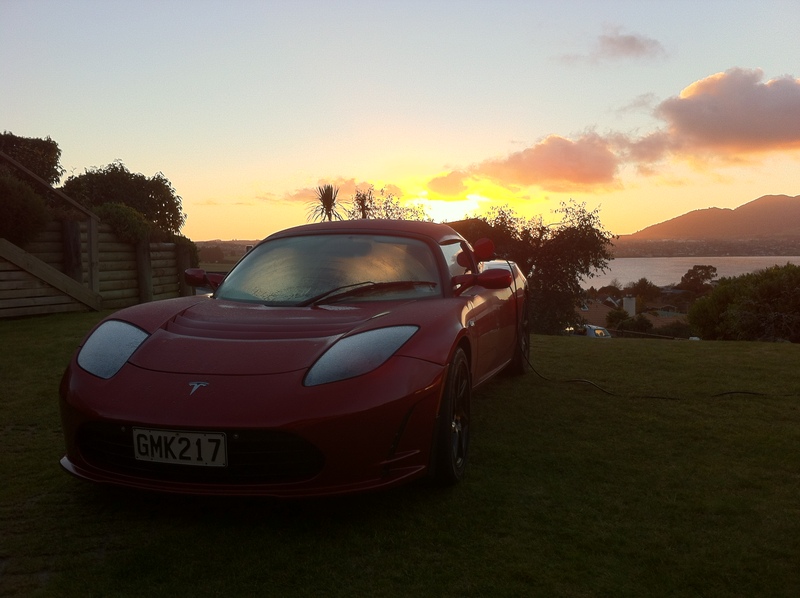 So a couple of years ago, when a chap named Rob McEwan contacted my husband and asked him to attend an EV conference here in Auckland – little did we know it would herald. 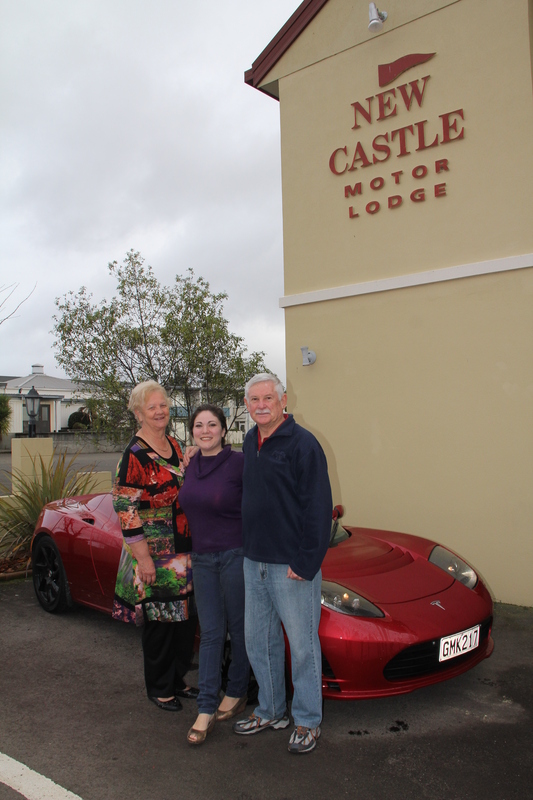 Long story short, Rob is the president of APEV(The Association for the Promotion of Electric Vehicles) here in NZ. He’s a clever, enthusiastic, and very well travelled man who is passionate about interesting, ethical and sustainable endeavors. Nice fella, and very Hobbit compatible it turns out. We attended the Green Living show at Auckland’s ASB show-grounds with him a couple of weeks ago, and accepted an invitation to come down to get the ball rolling on his Evolocity competition and events which will be happening at the end of 2014 (more on that later, it is AMAZING!). We gratefully accepted the offer, palmed the kids off to family members and headed south for three days. Now, for those of you who aren’t familiar with EV, there is something called range anxiety that EV drivers have to contend with, especially in places like New Zealand where the uptake is at an almost pre-early adopter/pioneering stage in the roll out. There is no high-speed infrastructure here to charge our cars if we run low on juice. So we rely on people we know to allow us to plug in if we need juicing up between destinations, as any 10amp socket will work to slow charge an EV. This will change, as my mega-man-crush Elon Musk is rolling out an amazing network of quick charge stations around California and the rest of the continental USA, but NZ is often the last to get on board with this stuff. Grumpy studiously did his math and figured out we could make it from our door to Taupo, but we decided it would be safer to detour to Rotorua for the night to charge. The owners of the New Castle Motor Lodge where we stayed were bemused, but very sweet about letting us stick an extension chord out the window to Charge the car overnight. It was cheap and clean and cheerful and we would recommend it to any of our friends if they are cruising through Rotovegas for any reason! So after snapping a couple of pictures, we were on the road again. Unsure as to whether we would feel welcome staying at Rob’s place, and also unsure about our range, we arranged with the New Castle Motel owners to stay with them on Monday night and head home from there. Well, any misgivings we might have had were well and truly put to rest when we pulled up to our digs for the night. Rob had mentioned that he owned a lodge, but what on earth that meant we had no idea. We also own a lodge, which is a little bit more than a wooden tent at the bottom of a ski field compared to the five star resort in Acacia Bay that Rob and his fantastic wife Becky own. So yes… we felt pretty darned welcome. We plugged the little red rocket in and sat down for a cup of tea with our hosts. We talked about clean energy, we talked about impending environmental and social crises, we talked about plenty of touchy subjects and found that Becky and I were often on the same page, while Rob and Steve were also quite prone to agree with each other. That night there was much wine and laughter and fantastic food shared with fabulous new friends. I have a pretty tough job and a really hard life wouldn’t you say? In the morning we headed out on meetings. Some of which I am not at liberty to share. We ended up at the race track in Taupo where I met three amazing people, all of whom I’ll be working closely with over the next 18 months to help Rob get this amazing event up and running. One of them was the world famous retired Formula One driver Chris Amon. I was pleased to see that we had so much in common. Chris is a humble guy, who was a true early adopter with sustainable living and he put solar on his property back in the days it was eye-wateringly expensive to do so. Chris also adores Toyota, as do we. And we’re longing for the day when Toyota comes out with full electric vehicles, as we currently own three Hybrids (Prius, Lexus GS450h, and Estima seven seater soccer mom van) that we adore. Chris and I had a great talk about the Lexus. I felt mighty chuffed to be treated like a girl racer by someone as genuinely cool as Chris. 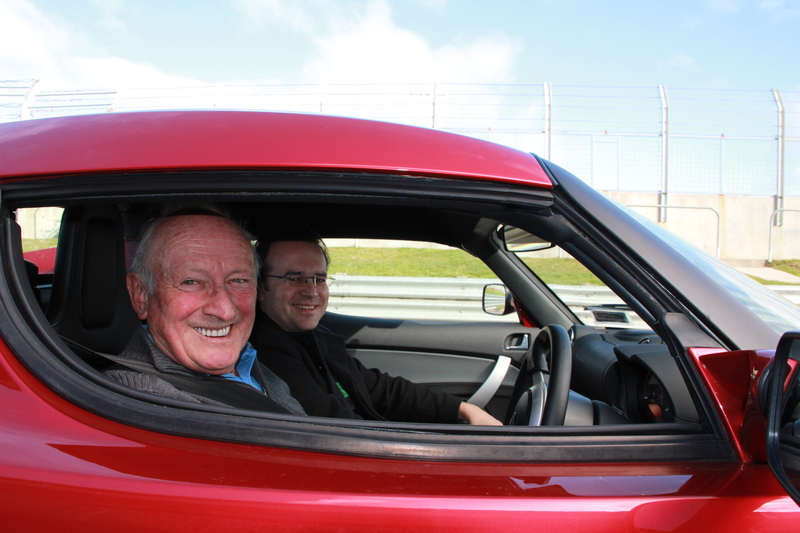 We invited Chris down to take a ride around the track in the Tesla. We talked it up like a couple of proud parents of an honor student or something. So really, someone with such an amazing track record (pun intended) might be let down by the experience of driving an EV race car around a track for the first time. Nope. Dude landed back at the pit stop after he’d taken a few laps with an EV grin from ear to ear. He described his experience as “magic” and that is exactly how we feel. 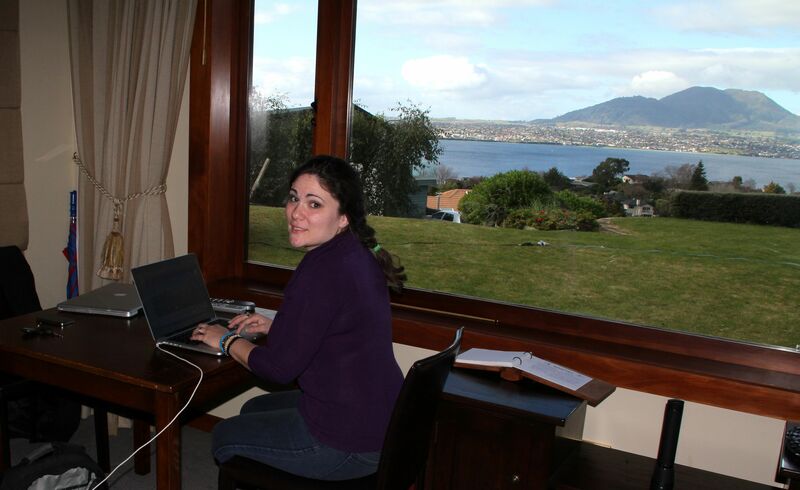 We landed back at Tauhara Sunrise Lodge and I settled in for a quiet afternoon while Grumpy hung out with Rob. We had a lovely dinner with our hosts and an early night and then headed back to Auckland the next morning. I am so honoured to be a part of this. Thanks for tuning in and PLEASE like the APEV facebook page as I am helping to administrate it and would Love to share all the exciting news about what we’re doing with you. Awesome stuff Dee, I don’t know Rob but I’m sure we’ve spoken on the phone through my work at various corporates on sustainability stuff. Interesting that you can plug in anywhere, I have a special 15amp plug in my garage and have serious ‘range anxiety’ as I can only go about 70-80kms in my little shopping trolley of an EV and can’t charge up anywhere else. Well, I say shopping trolley, I had the baby in carseat, 2 prams and a great dane in it this morning and still room to put my coffee in the holder 🙂 ANYway, I’m keen to hear more about what you and Rob have planned… have always followed APEV with interest, just wish they did more in the big smoke! Saw a great quote today… kinda related… “a developed country is not one where poor people drive cars, it is one where rich people take public transport”. Nice. I saw that quote too! By the Columbian President I believe? Awesome right? So glad you liked the post 🙂 I’ll be seeing you online Sophie! Have a great night.